A videogame can be broadly defined as any form of computer-based game involving one or multiple players. What is considered to be a video game covers a broad spectrum ranging from simple games played on mobile phones to vast virtual worlds existing for twenty four hours a day; seven days a week on the Internet. The study of videogames focuses mainly on games played on PCs or on dedicated games consoles like the PlayStation, Wii or Xbox. In the 1970s and early 1980s computers were not commonly found in the home and videogames were generally played in specialist arcades. 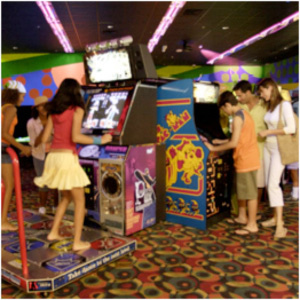 Games like Pac Man, Asteroids and Space Invaders became very popular. Space Invaders was so popular in Japan that the national bank had to mint extra coins because so many had been used up playing the game. The mid 1980s and 1990s saw the rise of the personal computer and for the first time the popularity of dedicated gaming consoles meant that the main place to play videogames was at home and not in arcades. The Nintendo Entertainment System (NES) was released in 1985 and the first PlayStation a decade later in 1995. By the late 1990s computer technology had improved to such an extent that videogames went from two-dimensional ‘platform games’ to three-dimensional virtual worlds. 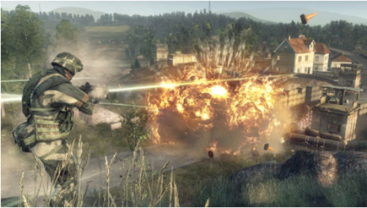 Today their graphics rival those of cinema blockbusters with realistic settings, characters and impressive special effects - as this screenshot from Battlefield: Bad Company (EA 2008) shows. 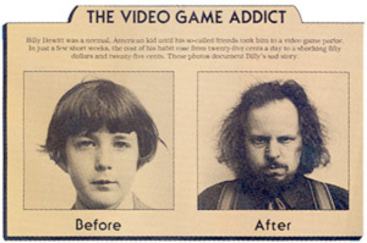 Despite being very popular since the 1970s, videogames were not taken seriously by academics until 2001. Before that time they tended to be seen as a children’s medium and looked down upon as examples of ‘low culture’ - with simplistic storylines and stereotypical characters.